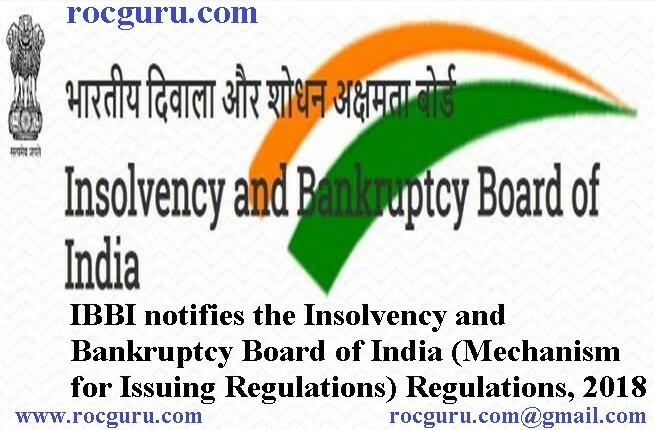 IBBI notifies the Insolvency and Bankruptcy Board of India (Mechanism for Issuing Regulations) Regulations, 2018 IBBI notifies the Insolvency and Bankruptcy Board of India (Mechanism for Issuing Regulations) Regulations, 2018 - RocGuru: GST Filing| Business Registration |Trademark | EPF & ESIC Compliance. The Insolvency and Bankruptcy Code, 2016 (Code) is a modern economic legislation. Section 240 of the Code empowers the Insolvency and Bankruptcy Board of India (IBBI) to make regulations subject to the conditions that the regulations: (a) carry out the provisions of the Code, (b) are consistent with the Code and the rules made thereunder; (c) are made by a notification published in the official gazette; and (d) are laid, as soon as possible, before each House of Parliament for 30 days. Given the importance of subordinate legislations for the various processes under the Code, it is essential that the IBBI has a structured, robust mechanism, which includes effective engagement with the stakeholders, for making regulations. Section 196 (1) (s) of the Code requires the IBBI to specify mechanisms for issuing regulations, including the conduct of public consultation processes, before notification of regulations. In sync with this philosophy and the statutory requirement, the IBBI notified the Insolvency and Bankruptcy Board of India (Mechanism for Issuing Regulations) Regulations, 2018 (Issuing Regulations) to govern the process of making regulations and consulting the public . the manner, process and timelines for receiving comments from the public. The Issuing Regulations are effective from 22nd October, 2018. These are available at www.mca.gov.in and www.ibbi.gov.in. Subscribe to get awesome updates.! Copyright © 2019- RocGuru.com. All rights reserved.